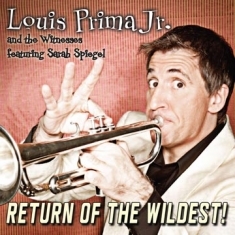 Now, LOUIS PRIMA JR. (www.louisprimajr.com) is stretching the boundaries between the swing and rock eras, turning up the fire and adding blistering energy to a batch of Prima classics on Return of the Wildest!, his debut album on Warrior Records/Universal Music Distribution. Prima Jr.’s debut album draws from his legendary father’s catalog, while revving up and dynamically re-imagining the songs for the current generation with eclectic, ever-evolving tastes. With fifty years of Prima music to choose from, the entertainer had a wealth of material to work with and ultimately chose songs that fit in best with the strengths of his band. The set list on Return of the Wildest!, as in his live shows, includes a mix of familiar classics (“Jump, Jive, An’ Wail,” “Just A Gigolo/I Ain’t Got Nobody”) and award-winning gems not immediately associated with Prima (“Oh Babe,” “Sunday Kind Of Love”). Recording Return Of The Wildest! at The Tone Factory in Las Vegas (owned by longtime friend Vinnie Castaldo, who co-produced the album with Prima), Prima Jr. went old school, recording mostly live, as his father did, to maintain the energy and flow of the music. He recorded the rhythm section live in three days, then the horns in two and vocals in one. To ensure that the live energy translated to the final product, he bucked conventional modern wisdom, and while doing a bit of editing, didn’t do any major Pro Tools fixes. Louis Prima Jr. has traveled a long road to carry on his father’s amazing legacy— starting with the drums at age five, piano at seven, guitar at eleven, and eventually the trumpet through his high school years. His professional journey began in the ‘80s, fronting rock bands until he finally settled into his father’s style and music. Since 1995, Prima Jr. has juggled a part-time music career while raising his two children and working as a food and beverage manager. While he had been dabbling with the current concept since the mid-2000s and performed off and on in the intervening years, Prima Jr. finally felt right about committing full-time to recording and performing again when he found band mates who were as dedicated as he was to making it happen. Joining Prima Jr.’s band of seasoned rock musicians is renowned singer, actress and musical theater performer Sarah Spiegel. While many large ensembles have members rotating in and out based on availability, this “family” of Witnesses has more of a rock mentality, in which the band that plays together, stays together—and plays together as friends after the shows are done. Anyone who comes to hear a mere “tribute show” should be prepared to have their socks knocked off – or stay away. Prima Jr. isn’t keen on nostalgia – he comes to rock! Bringing a new energy and current attitude to the music, Prima Jr. and his band are less concerned about reliving the past than about creating a future for it. More than a tribute show, like the kind you might see in a supper club, he has created a bona fide rock act that pays tribute in a concert atmosphere. Since their recent breakout performance at the New Orleans Jazz and Heritage Festival (aka Jazz Fest) in Prima Sr.’s hometown, the ensemble has performed everywhere from Seattle to Palermo, from small clubs, performing arts centers and major casino showrooms to some of the largest music festivals in the world. One of the highlights of this musical odyssey, and a proud moment in Jr.’s life, was on July 25, 2010, the year Louis Sr. would have turned 100. Prima Jr., Spiegel and The Witnesses were present when the legend received his long overdue posthumous star on the Hollywood Walk of Fame. Prima Jr. accepted the star on his father’s behalf, and then Prima Jr. and his band performed a rousing homage to his father, that had the thousands of spectators and paparazzi dancing in the street, turning Hollywood and Vine into Mardi Gras. Prima Jr. infuses that live rock and roll feel into the ten tracks on Return of the Wildest!—whose title is a sly wink back at Prima Sr.’s 1956 Grammy Hall of Fame album The Wildest!, which captured that generation of listeners with its innovative mix of rock and roll, jump blues, jazz and eccentric humor. Since the 2010 New Orleans Jazz and Heritage Festival, Prima Jr. has performed hundreds of shows for fans of all ages around the world.